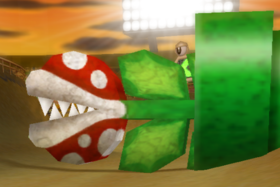 Mecha Piranha Plants or Piranha Plant (mechanical) are course hazards that appear in Waluigi Stadium in Mario Kart: Double Dash!!. They resemble flat wooden Piranha Plants. Paired with Podoboo Cogs, they are found on the long straight of the course pointing south. They slowly come out of slat mechanical green Warp Pipes with slot-like holes; they serve as a wall and cause players to stop when they are bumped into and they cannot be destroyed. A total of three appear in the course. They reappear when Waluigi Stadium returns as a retro course in Mario Kart Wii, but their left-to-right locations on the track are reversed. "Sliding horizontally out of a giant green pipe, these are part of the scenery. Dodging is the only way to avoid them." ↑ Hodgson, David S. J. Mario Kart Wii Premiere Edition. Page 128. This page was last edited on April 3, 2018, at 22:33.